Best-selling author and legendary angel lady Diana Cooper talks about her life, her psychic journey and her belief in angels, unicorns and the crucial importance of spirituality in our lives. Diana Cooper’s book New Light on Angels (Findhorn Press) was quite simply mind blowing when it was first published in 1996. I remember reading it in one sitting, barely pausing to eat, drink and sleep. 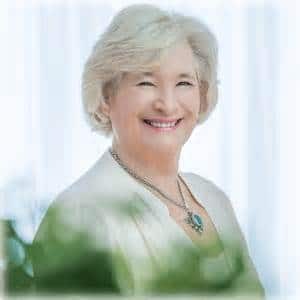 In the years that followed Diana Cooper’s books have continued to open reader’s eyes, minds and hearts to the very real possibility that there is an invisible spirit realm out there guiding us and I could not have felt more blessed when the angel lady herself agreed to take some time out of her hectic schedule to talk to me. Thank you for speaking to me Diana as you are an inspiration to every spiritual writer out there. Could you tell us more about your life before you became famous as an angel lady? Yes, of course. Before I found my spiritual calling my life was very ordinary. I went through the veil of amnesia. I had little self-confidence and self-esteem and did not have any religious, psychic or spiritual background. In some ways I felt my life was lived in black and white until my early 40s when it transformed into glorious technicolour and I found my true calling as a spiritual teacher. I was 42 and in the middle of a messy divorce. In short, I had reached rock bottom. The only thing for me to do was to ask the universe to help because there was no way to turn to and no one who could help me. I remember clearly shouting out loud, ‘If there is anything out there, show me – you have got one hour.’ It was an act of despair and I truly did not think I would get an answer but suddenly a beautiful six foot tall golden angel appeared right before my eyes. Hard to explain but the angel pulled me outside my physical body. I went flying with the angel and was shown wonderful things – the most memorable being a hall of people with rainbow coloured auras. I was told that it was my destiny to be a spiritual teacher. The angel then brought me back and I looked at my clock and it was exactly one hour later. That must have been an incredible experience. Did it immediately lift you up out of despair and give you a sense of meaning? Sadly, no – not completely. I still had bouts of despair and hopelessness afterwards but I never sank as low as previously because I knew deep down that there were angels there to lift me up when I needed it. I trained as a hypnotherapist and started practising. I loved the work and could see angels around my clients but I did not engage with them or tell my clients about them at the time. When did you start talking to people about angels? Ten years later – so in my early 50s – I had moved house and was in a more positive state of mind. I remember lying in my bath and asking my angels for guidance about my work. To my complete amazement I heard an angelic voice reply to me like a golden light in my mind. The voice told me it was time for me now to talk to people about angels. I was shocked and replied that I didn’t want to do that for fear people would think I was mad. Then I got the most profound and life changing reply and one I will never forget: ‘Who is doing your work? Your ego or your higher self?’ I knew instantly then what I had to do and agreed to do it. I got out of the bath and three angels stood in front of me like shining beacons and told me about the angelic realm. I wrote down everything they told me and that book was New Light on Angels. You were pretty low and suffering a lot when your angels first spoke to you. Do you think that is when angels are most likely to get in touch with us – when we feel low and hopeless? I sincerely hope not as I would not want anyone to suffer as I did with depression and despair. I hope that I have done the suffering for others so they don’t need to. I hope my books will show people that they don’t need to sink low to speak to angels and that angels are always there for them. In my books I explain how to connect with their angels – that has become my life mission.I’m known as the angel lady. I recall your appearance on a morning TV show and the sensational response from viewers. Please tell us about that. Yes, I was about to go on air to talk about angels and I was asked if I wouldn’t mind having my aura photographed. I was more than happy to and just before the photo was taken I asked my angel to step into the photograph with me. I wanted people to sense its light in some way and to get something indirectly from this light. I had no idea what this would trigger as my angel actually impressed itself onto my aura. You can actually see the round head of an angel and golden rays of light pouring through the picture. As you can imagine the telephones went crazy with viewer response and the show received around 114,000 calls. I was asked to come back the next day because so many people wanted to talk about angels and experiences they had never spoken about before. It was awesome. If you visit my website www.dianacooper.com you can see the aura photograph there. As well as angels you talk about spirit guides in your books. Who is your spirit guide? My guide is Kumeka and he was instrumental in the setting up of the experiment of Atlantis. He has guided me through all my lives but he has never incarnated. Yes I believe in reincarnation – and he is constantly with me. He gives me the information I write about in my books. Wow! That is out of this world. Your experiences are paranormal and I guess a lot of people might find it hard to accept. How do you deal with skeptics? I know my own truth and what is real for me. If people are not ready to hear my message then the time is not right for them just as the time was not right for me to believe in angels before my early 40s. When people are ready they can see or sense their angels and guides. The only thing blocking that from happening now for most people is fear. Replace that fear with love and angels will appear. You can read more of my angel experiences in my book, True Angel Stories 777 tales of hope and inspiration. All royalties from this book go to the Diana Cooper Foundation, a not for profit organisation. Please tell us about your foundation. My angels asked me to start my foundation in 2001. It started as a school of Angels and Ascension. With absolutely no knowledge of writing training courses but with energy and faith I set up the school and now I have so many wonderful teachers who are skilled in course writing and all aspects of running a spiritual organisation. That is exciting. As well as your best-selling books, CDs, cards and Foundation do you have any other projects ongoing? Certainly, I have a busy lecturing and workshop schedule all over the world. My workshops are interactive and I try to make all the information in my books come alive in them. I offer spiritual exercises and tools for people to learn and use in their daily lives and it gives me great joy to see their auras expanding and becoming golden so angels can communicate with them more effectively. I also run an angel correspondence course. My special focus right now is on my children’s books which are written to empower and inspire children and help them accept an expanded reality. My dream is to see them on the big screen and my dream may be about to become a reality – so watch this space. Double exciting. You must never have a moment free with so much going on. How do you find time to relax? Simple, I take a long walk in nature. That is all I need to recharge and inspire me. I live in Dorset now which is a beautiful area to walk and see unicorns and elementals or nature spirits. Walking in nature is how I raise my vibrations and stay in tune with my life. I also find that learning and writing about spiritual matters raises my vibrations – spending time with my family and my dog does too. I think any time you do what you love angels are close by. Just take a moment to be still and feel their guidance. They will use those quiet moments of love to send you silent messages. I’m a huge fan of unicorns. Thank you from my heart for your amazingly beautiful unicorn cards. They are beautiful aren’t they and the reason they inspire and uplift so many people is that unicorns are a symbol of spiritual innocence, purity and light. My cards are very popular, particularly my angel and Atlantis and unicorn cards. The first time I met a unicorn I was sitting in my garden and I felt this pure whiteness around me. I saw my unicorn and it told me it wanted to connect with me. In the golden era of Atlantis everyone had a unicorn but the energy disappeared. Now it is returning and it is my task on earth to help people connect with them again. If you dream of a unicorn it is their calling card to you. Sounds truly magical. As you know I believe in angels. Should we ask them to help us? How do we call on them? Yes, the more you ask your angels to guide you the more they will be there for you. They are always by your side constantly whispering words of guidance, comfort and hope. They also organise synchronicities and coincidences so things fall into place for you at just the right time. If it is not your time to die they save you. They send us love and healing and are always by our side, we just don’t realise it. And the best way to call on your guardian angel is to think of your favourite colour and imagine yourself surrounded by that colour. Then the guardian angel associated with that colour will step into that colour and connect with you. Please tell me which colour is linked to which angel? Everything you need to know is in my books and this is far too complex to cover quickly but in brief angel Gabriel is pure white and brings clarity; Uriel is golden yellow and brings confidence; Metatron is golden orange and brings grace; Michael is deep blue and brings strength and Chamuel is glowing pink and brings love. And if any shade of green is your colour that is Purlimiekwho will connect you to the world of nature. Do you have any special message you would like to say right now to a world still torn apart by religious differences? Religion is a path to ascension but not the only path. We are all heading up the same mountain towards the light but those who follow the spiritual path and are guided by their angels are like a light shining own for others to follow. Trust and believe in angels and you become like a light. You help others see with clarity. You bring light into darkness and in the process inspire and guide others and light up the world. I think we live in incredibly exciting times. I believe this is the dawn of a new age of spiritual awareness and feel truly blessed to have been chosen to help others find their inner light and see their own way ahead. Thank you Diana. It has been a blessing and a revelation speaking to you. I feel extremely thoughtful when the phone call ends and take Diana’s advice and treat myself to a few moments moment of silence to feel the presence of my angels and reflect on our conversation. Unlike Diana, I can’t see angels, auras and unicorns and I have no idea if I have a spirit guide, let alone one from Atlantis, but all this doesn’t seem to matter as I am in wholehearted agreement with her passionate belief that we are spiritual beings having a human experience not human beings having a spiritual experience. If you would like to find out more about Atlantis, unicorns, archangels, angels, spirit guides or the legendary Diana herself and her many books, courses and workshops I urge you to visit her website www.dianacooper.com. I think you will find it all mind blowing. As always, I’ll end this interview with some quotes that I feel sum up Diana Cooper – the angel lady. What a delightful interview, Theresa, and thank you Diana for sharing your experiences. I have long been fascinated with unicorns, angels and Atlantis and hope to meet Diana again when she visits Glasgow next weekend to expand my knowledge further in these areas. I speak to Archangel Metatron and Sandalphon every day when I am out driving and see the numbers 55 and 59 – always near one another! I also like to give daily thanks to Archangel Michael, Archangel Uriel, Archangel Raphael and Archangel Gabriel for all of their ongoing wisdom and intuitive guidance. Thank you!